Christmas. She is strung, has bent legs, sleep eyes with eye lashes, a closed mouth, a glued on mohair short hair curly wig. Her eyes have a brown ring around a blue center of the iris. 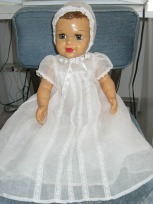 Her outfit is a white two piece stiff gauzy dress and slip with a hat. 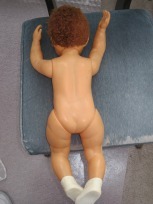 She is wearing soft white N.Y. Doll Shoe Company shoes #22. she has no identifiable markings. Can't seem to find her anywhere on the internet. Can you help me identify her? We would like you to visit our sister website Montana Doll Lady - here is the link - http://www.montanadollady.com/ you need to copy and paste in your browser.